When ElevationLab first started promoting the Elevation Dock 2, I thought the name seemed a bit misleading: as far as I could tell, it was just the original Elevation Dock bundled with the Lightning adapter and something called “NanoPad” to help it grip the desk a bit better, which I figured would work about as well as most non-skid rubber sheeting. The original Elevation Dock’s major problem was its huge production delay, followed by Apple releasing the iPhone 5 with the brand new Lightning connector right as most Kickstarter backers were getting their docks. Rather than go through the lengthy and expensive process to build an officially licensed Lightning dock with a custom connector, ElevationLab rushed to release a quick fix: a little clamp that mounted Apple’s stock Lightning cable into the existing Elevation Dock. It sucked, mostly because the cabled Lightning connector requires too much force to remove: enough effort to remove the phone would also lift the Dock right off the table, ironically giving it the same annoyance that ElevationLab made fun of in their original Kickstarter video. It was a beautifully manufactured, high-quality dock that didn’t work very well. In the meantime, I switched to another Kickstarter heavy-dock project, the Dock+. It works decently, has a real low-friction Lightning connector, and charges iPads as well, but is sloppily made and a bit ugly. 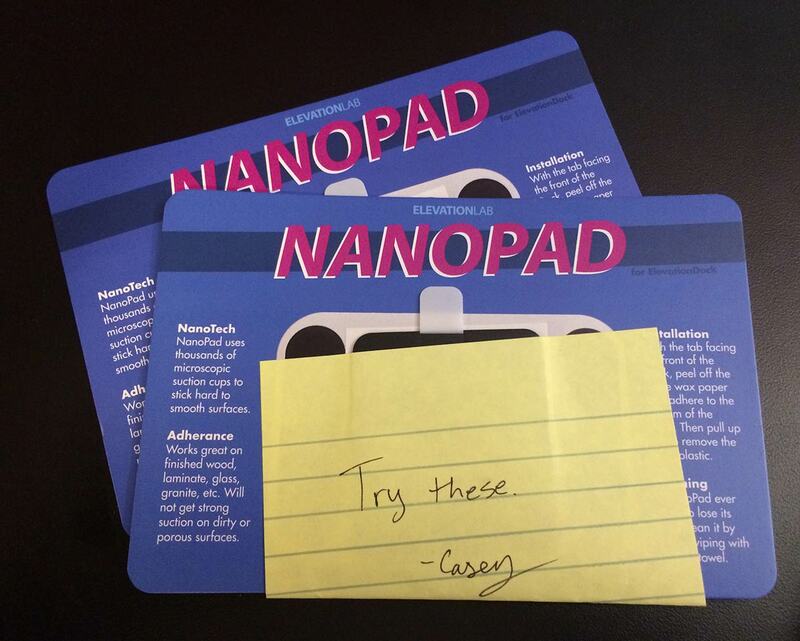 Photography verified that the NanoPad is indeed cool. But most important is how it works. And it works incredibly well. 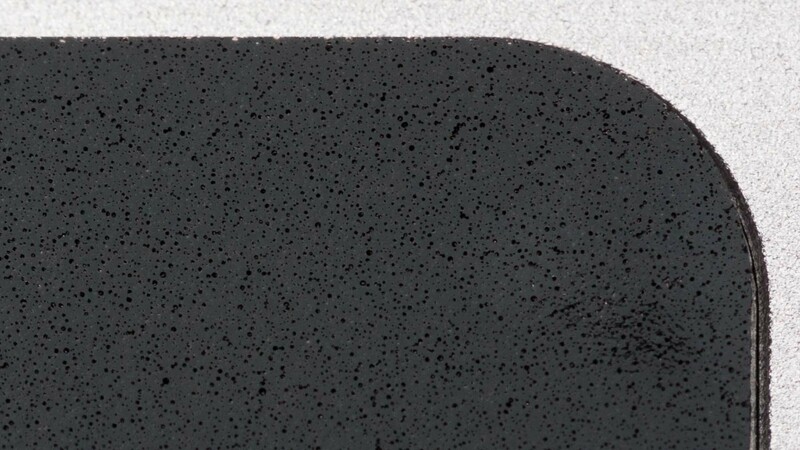 Assuming the NanoPad was like typical non-skid material was a gross underestimation of its grip — it’s more like a strong adhesive, although it comes off cleanly and reattaches easily. It works exactly as promised, and ElevationLab is not exaggerating with any of its claims. In fact, it’s so good that I might buy a few extras to adhere other objects to desks, tables, and counters. None of this makes the Elevation Dock’s Lightning compatibility less of a hack. Now, it’s another hack on top of the previous hack, but this hack actually works. You still need to supply your own Apple Lightning-to-USB cable, and it’s still an inelegant, high-friction connection — the NanoPad just makes it a one-handed operation. Despite the hackiness, that’s a substantial improvement. Before the NanoPad, the Elevation Dock worked so poorly with Lightning that I stopped using it entirely. Now, I’m back to it. For $7, I definitely suggest that Lightning-adapted Elevation Dock owners give the NanoPad retrofit a try. For new buyers, it’s less persuasive: you’re still looking at spending at least $90 for the dock, plus losing an Apple Lightning cable and AC adapter to it (or buying extras from Apple for a total of at least $38). It’s a tough sell. It’s a pile of hacks, but it works, and it looks much nicer and is better made than other docks I’ve seen and used.